The famous mascot made an early “in person” appearance at a Halifax nursery this week and in spirit he is likely to be with BBC Look North presenters Harry Gration and Paul Hudson as – strapped together, three-legged style – they make their way through Elland, Rastrick, Brighouse and Hipperholme today en route from Huddersfield to their finishing line 15 miles later at Halifax Piece Hall! After conquering the hills, including venturing over the infamous Shibden Wall, they aim to reach the Piece Hall at 5pm. Also at the Piece Hall, Look North presenters Amy Garcia and Owain Wyn Evans will be joined by 163 pupils from schools including Salterhebble, Old Town and Luddenden Foot, to form part of a national choir singing a beautiful jazz rendition of Over The Rainbow. 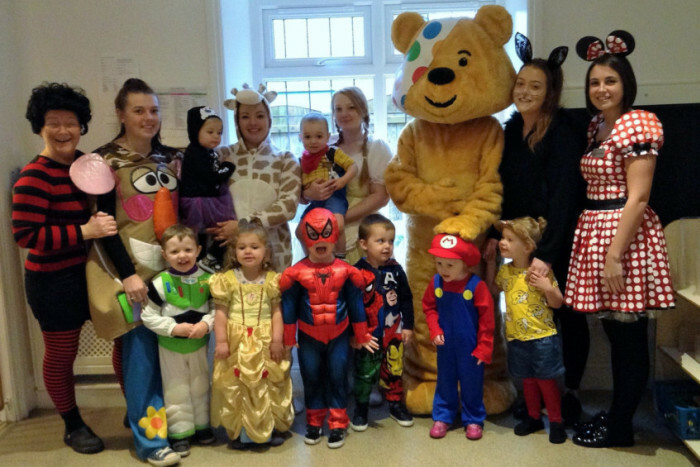 Are you doing something for Children In Need this weekend? Why not send us your pictures and a few details about what you were doing?